黃麗群 Born in 1979 in Taipei, Huang graduated from National Chengchi University's Department of Philosophy and went on to work in media. Her pen name is Jiu Jiu. Her published works include the story collections Fallen Xiao Luren, Eight Flowers Blossom, Nine Seams Split, and Welcome to the Dollhouse. In the course of her creative life, she has brought out three volumes of her accumulated short stories, only a third of which are published under her real name. Her writing is precise, with every word in its proper place, as she describes the feeling of being an outsider commonly experienced by those in the lower classes of society. Her eyes accustomed to city life, she sees right through Taiwan's weird wonders. She’s won virtually every major short story prize in Taiwan, including the China Times Literary Award, the United Daily Literary Award, etc. Ms Huang is represented by The Grayhawk Agency. 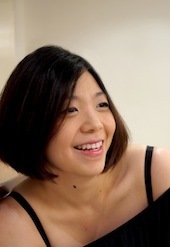 Sabrina Huang is the featured author in READ PAPER REPUBLIC, week 16, 1 October 2015.